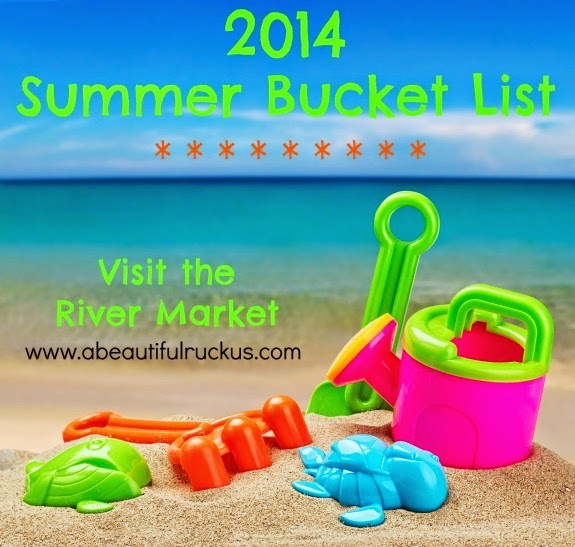 We've already started in on our Summer Bucket List for 2014! And our first activity ended up being...a doozy. On Saturday morning, we woke up and did a nice little combo of yard work while stopping periodically to play with the kids. We gave the kids' new baseball bats from the grocery store a whirl with Daddy pitching, and Mommy as the assistant batter. They seemed to have a lot of fun with that! And then I got the idea that we should all head downtown to the River Market (a giant Farmer's Market). Sean warned me that 10:30am on a Saturday would probably not be the best time to go, but I was pretty sure that we could find parking. We drove all the way down there, and they were packed out. So packed out that there were no parking spots for a two block radius around the market. So sad! I love the River Market! Their produce is insanely cheap, they have a bulk spice vender that I wanted to visit, and several ethnic markets with delicious food. But wishing wasn't going to make the crowds dissipate, so we turned the car around to head home. I hate loading the kids in the car, telling them we are going on an adventure, and then having to disappoint them. So halfway home, we decided to try the Overland Park Farmer's Market instead. Happily, we easily found a parking spot, but by that point, the boys weren't interested in adventures anymore. We had a couple of very whiny butts on our hands. In fact, they were so tired and overwhelmed by the people and noise that we lasted...oh, about 10 minutes total there. It wasn't just any lady! It was our kids' doctor from our NICU days. She didn't recognize Sean and the boys at first (understandably as they are a lot older now), but when I turned around with the girls, she suddenly realized that she was looking at the Ishum Quadruplets! Of course, our boys threw a royal fit when we tried for a photo at the Farmer's Market, but we can't win every time, right? It was such a treat to see her, especially since it was in a non-medical situation. Doctors are so good about maintaining composure even when they are delivering bad news like Dr. Florendo had to give to us several times. But because she wasn't in doctor mode, and we caught her so off guard, so started crying as she dropped everything on the ground to free her arms for hugs (okay, I started tearing up too). I think we often forget that our medical professionals are people too and they invest not just their expertise but also their hearts in long-term situations like ours. 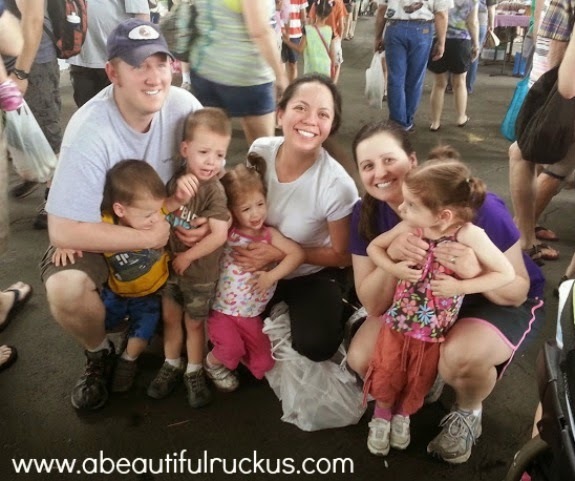 We could tell how much it meant to her to see our kids not just surviving, but thriving! The last photo we took with Dr. Florendo was when the quads were 5 months old, so it had been a long time! Once we grabbed our photos, we headed back to the car. The boys were literally throwing themselves on the ground (so embarrassing!) and there was no saving our visit. And then, you'd think we would have learned, but we stopped by the Organic and Natural Farmer's Market on the way home. Six booths. That's it. Such a tiny Farmer's Market that we thought surely the boys could handle walking around for five minutes. Not so much. In fact, one of them threw themselves into one of the booths, causing quite the scene. Yay for parenting. All that to say, our adventures to three Farmer's Markets ended up being a total and complete bomb. BUT, Sean and I both agreed that seeing Dr. Florendo made the morning worthwhile! And the next time we try to go to the Farmer's Market, we are leaving A LOT earlier in the morning. Oh no! Hopefully next time you try this adventure it will go more smoothly. I feel like if you had been able to get a spot at the River Market, you would have had some better success. It's nice that you were able to bump into a familiar face though! That always makes for a happy(ier) ending.